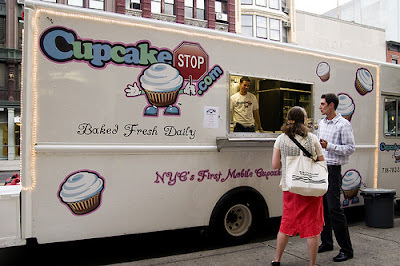 Beginning at noon tomorrow, CupcakeStop will be giving away 100 specially made mini coffee cupcakes and 100 cups of Oren's Special Blend coffee to celebrate Oren's Daily Roast coffee, which is served up regularly on the truck. We hear they'll be located at 5th Avenue between 22nd and 23rd Street, but check their Twitter feed to confirm. I went to cupcake stop today at 12:05 and they had no idea what I was talking about when I mentioned free cupcakes and coffee.